cardigans and kids: homemade granola. -preheat the oven to 325 F.
1. whisk the oats, salt and cinnamon in a large mixing bowl. 2. In a separate medium sized bowl mix together oil, maple syrup, brown sugar, honey and vanilla until the sugar has dissolved. 3. pour the wet mixture over the oat mixture and mix together with a wooden spoon or your hands. 4. either spray a jelly roll pan with oil or using parchment paper, spread the mixed ingredients out even on the pan. Place the pan into the pre-heated oven for 10 minutes. 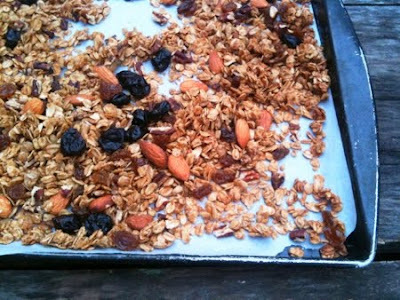 5. using a hot pad, remove the pan from the oven and using a spatula or wooden spoon, move the granola mixture around, add the nuts and put back in the oven for another 10 minutes. 6. remove from oven again, re-stir everything around, put back in the oven for the last 5 minutes. 7. remove from the oven and add the dried cherries and raisins. Mix again in the pan and let cool. Or dive in and begin enjoying. 8. After it has cooled, store in a glass jar, or container of choice. The granola will last for about a week. *as for the oats - I have used organic steel cut, 1 minute quacker brand, and the old-fashioned kind. If you do not have a particular oat you like, I recommend trying them all, they all bake up a bit differently.